The orchestra preserved on this record appears to be something of an enigma. Once in a blue moon—in only the most dedicated of record collecting and researching circles—the question arises: ” Who is Abe McDow?” Alas, no definitive answers have ever been uncovered, and even the most dedicated of researchers have been unable to crack the case. Whatever their story, Abe McDow and his Band Southern cut five recordings—”I Idolize My Baby’s Eyes”, “Shine On Harvest Moon”, “Minnie the Moocher”, “I Apologize”, and “(With You On My Mind I Find) I Can’t Write the Words”—for the New York Recording Laboratories (manufacturers of Paramount records) in Grafton, Wisconsin, in 1931, near the last days of the company’s existence. Presumably, they were a territory dance band, likely touring in the Midwest, as did many of their contemporaries that recorded for Paramount. Though called the “Band Southern”, it is possible, perhaps even probable, that they did not hail from below the Mason-Dixon Line, but rather adopted the sobriquet to evoke certain images of Dixieland that were so popular at the time—much in the fashion of Henny Hendrickson’s so-called Louisville Serenaders. Paramount scholar Alex van der Tuuk has tentatively proposed that the orchestra may have hailed from Iowa. It is also possible that “Abe McDow” was actually “McDowell”—as is reportedly credited on the label of Broadway 1483—and his name was either misprinted or shortened by the people at Paramount (whose competence in record-making was often rather questionable), though research on that name, too, has returned little information. Broadway 1482 was recorded in November of 1931 in Grafton, Wisconsin. Regrettably, the personnel of the band is entirely unidentified, aside from vocalists Roy Larsen and Bob Lilley, who presumably make up two-thirds of the trio singing on the “A” side. First, the Band Southern plays a downright marvelous rendition of that evergreen 1908 vaudeville classic “Shine On Harvest Moon”, one of my personal favorite versions of the ubiquitous melody. 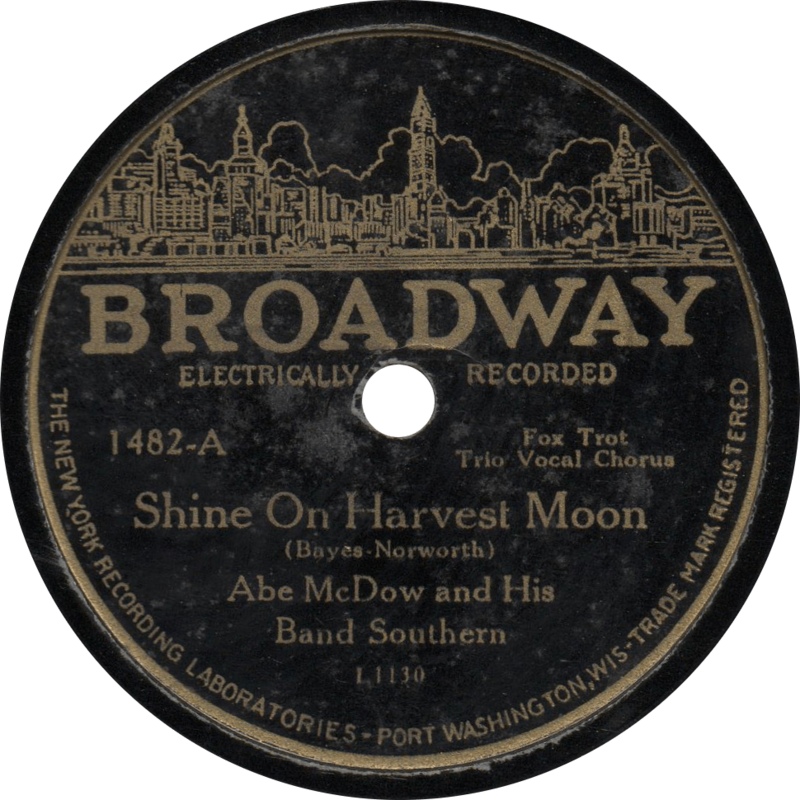 Shine On Harvest Moon, recorded November 1931 by Abe McDow and his Band Southern. 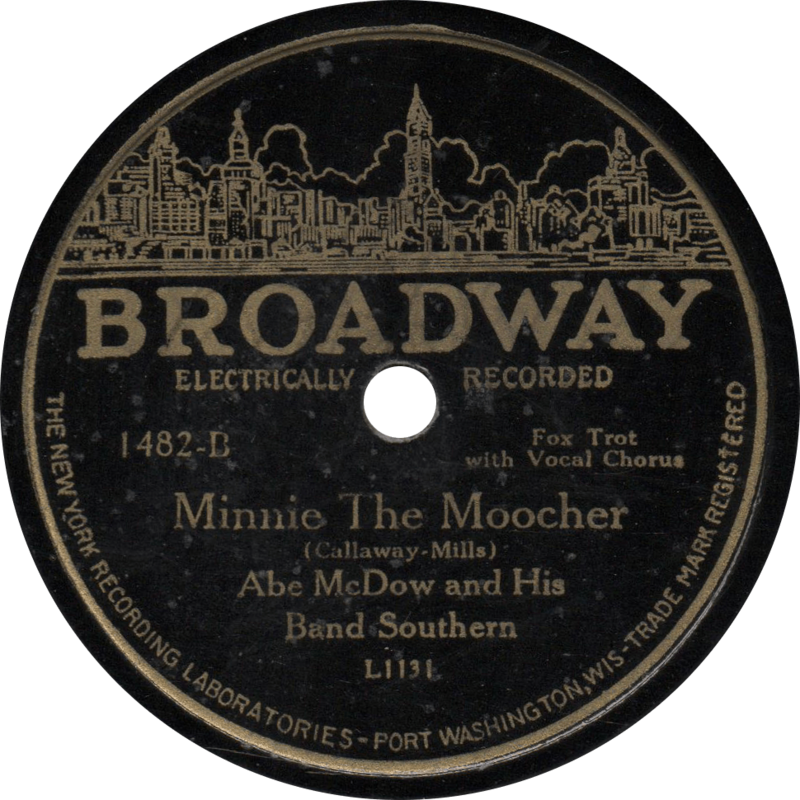 Minnie the Moocher, recorded November 1931 by Abe McDow and his Band Southern. This entry was posted in Records and tagged 1930s, 1931, Abe McDow, Broadway, Dance Band, Grafton, Jazz, NYRL, Popular, Territory Band by R. Connor Montgomery. Bookmark the permalink.